SÃO PAULO, BRAZIL – Estimates by financial analysts for Brazil’s Gross Domestic Product (GDP) growth in 2015 have decreased for the sixth consecutive time this year, from a contraction of 2.01 percent at the beginning of August to 2.06 percent last week, according to the latest Focus Survey, released by the Central Bank. If this forecast is confirmed it will be the lowest GDP growth rate in Brazil in the last 25 years. Government officials forecast lower growth and industrial production this year, photo by Marcello Casal Jr/Agencia Brasil. The weekly survey conducted with a hundred bank analysts however shows a reduction in the annual inflation rate (IPCA), from 9.32 percent to 9.29 percent. Moreover, for 2016 analysts forecast a much lower annual inflation, of 5.50 percent. According to the Focus Survey, industrial production is also expected to decline more than in the previous forecasts, by 5.20 percent by the end of the year, from last week’s forecast of a reduction by 5.00 percent. 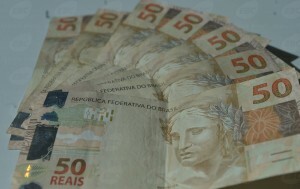 The recent surge of the U.S. dollar in relation to the Brazilian real, has also led analysts to forecast a foreign exchange rate of R$ 3.50/US$ for the end of 2015 and a rate of R$ 3.60/US$ at the end of 2016. Although inflation expectations increased while GDP growth and industrial production end-of-year numbers continue to contract, analysts have maintained their benchmark interest rate (Selic) forecast for this year at 14.25 percent. The financial market expects the Central Bank to start a downward trend of the Selic in 2016, ending the year with the interest rate at 12.00 percent. The forecasts for the public sector’s net debt have slowly decreased since June, but remained unchanged from the previous report, at 36.15 percent of the GDP. * This article has been updated since it was originally published on August 25th, 2015.